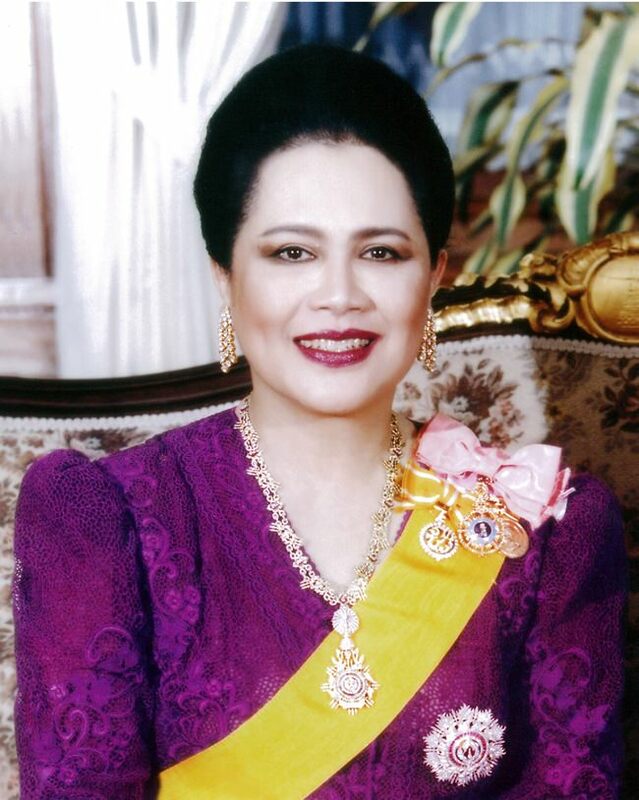 Her Majesty Queen Sirikit is the daughter of H.H. Prince Chandaburi Suranath (M.C. Nakkhat Mongkol Kitiyakara) and his consort Mom Luang Bua Kitiyakara (nee Mom Luang Bua Snidvongs). Prince Chandaburi Suranath was the third son of H.R.H. Prince Chandaburi Suranath and H.S.H. Princess Absarasman Kitiyakara. She was born on August 12, 1932. The year 1932 is a significant one: it was the year when constitutional monarchy was introduced into Thailand. Her father was a prominent and capable Major-General in the Thai Army at the time of the constitutional change. He left the army and went to serve as First Secretary at the Thai Legation in Washington D.C. As HM the Queen was then still a little child, she remained in Bangkok in the charge of her relatives. She did not see her parents again until their return home. She attended the Kindergarten class at Rajini School. But subsequently went to St. Francis Xavier School at Samsen District in Bangkok in order to be nearer to home. Her father later on became Thai Minister to France, to Denmark and ultimately Ambassador to the Court of St. James. Her Majesty accompanied him and continued her general education in the three countries and lastly in Switzerland. It was while her father was stationed in Paris that she first met His Majesty (the late) King Bhumibol Adulyadej, who was then studying in Switzerland but went now and then to Paris. The chance meeting in Paris ripened into friendship and understanding. When His Majesty met with a serious motor car accident in Geneva, Switzerland and had to stay in a hospital at Lausanne, Her Majesty was a frequent visitor. When His Majesty was well again and left the hospital, He was graciously pleased to arrange for Her Majesty to continue her studies at “Riante Rive”, a boarding school in Lausanne. On July 19, 1949 Their Majesties were quietly engaged in Lausanne. On March 24, 1950, Their Majesties landed in Bangkok by ship after a long absence. On April 28 of the same year, the Royal Wedding took place at Padumawan Palace before the Queen Grandmother. As a democratic King and Queen, Their Majesties signed their names in the Registry Book of Marriages. 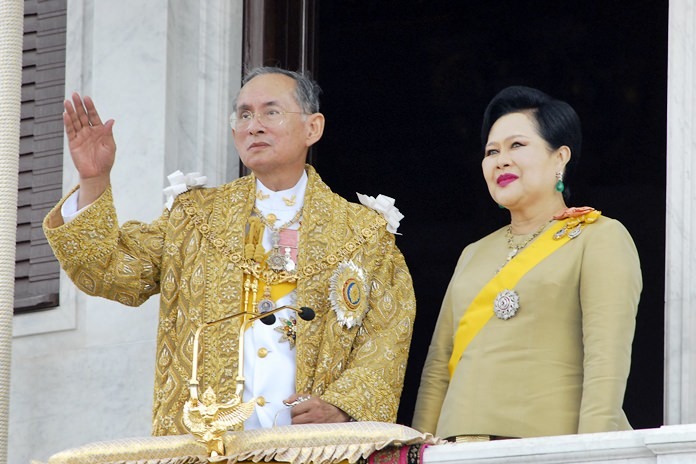 His Majesty then crowned HM the Queen in conformity with Thai tradition. Their Majesties have four children, namely: Princess Ubolratana, born on April 5, 1951, His Majesty King Maha Vajiralongkorn Bodindradebayavarangkun, born on July 28, 1952, Her Royal Highness Princess Maha Chakri Sirindhorn, born on April 2, 1955 and Her Royal Highness Princess Chulabhorn, born on July 4, 1957. Their Majesties took great care in the education of their children in order to prepare them to meet the various duties which they had to undertake in later life. A choice had to be made between private tutoring and sending the children to an ordinary school. Private tutoring is a good medium for imparting knowledge, but it lacks human contact with children of similar ages. Attendance at an ordinary school also has its drawbacks. From experience, it would appear that teachers, pupils and even parents are subjected to biases either favorable or unfavorable. In order to avoid these inconveniences, His Majesty, with the entire concurrence of Her Majesty, set up a school in the compound of Chitralada Villa. Better control and supervision could thus be assured. The school was established and registered in accordance with the law in November 1958. There were about 78 children in the school. The classmates of the Royal children were sons and daughters of ordinary people of various vocations. Her Majesty has performed many public functions. 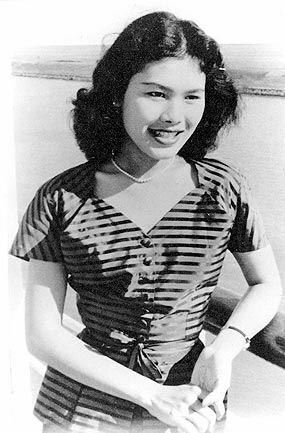 She became President of the Thai Red Cross Society on August 12, 1956, and Her keenness in the work built up Her popularity and aroused enthusiasm in the public for the cause of the Red Cross. Towards the end of 1959, H.R.H. Prince Nagor Svarga, who was Executive Vice-President of the Thai Red Cross Society, died unexpectedly. Her Majesty very ably carried on the duties which would ordinarily fall upon the Vice-President until a new Vice-President was appointed on March 18, 1960. Later on, in 1979, upon learning of the influx of about 40,000 Cambodian refugees into Thailand’s Trat Province, Her Majesty Queen Sirikit flew to the site to see the situation Herself. 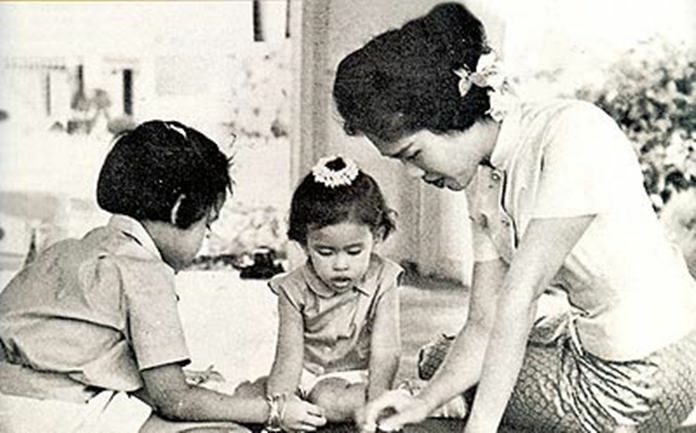 Then in Her capacity as President of the Thai Red Cross Society, Her Majesty set up the Khao Larn Thai Red Cross Centre to give shelter, food and medical care to those Cambodian refugees who were mostly peasant families with small children and unaccompanied orphans. The center became a refuge for these displaced people for some years. 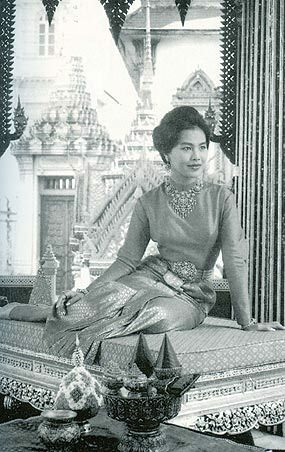 In her role as Honorary President of the Thai Red Cross, Queen Sirikit always gave her direct support to people in need. Recently, she donated funds to help support the treatment of people infected with the Chikunkunya virus, and took financial responsibility for many patients in desperate need of intensive care. A former entertainer, paralyzed for 7 years; a 7 year-old child with bone cancer and a 17 year-old badly burned girl were just 3 of many victims aided by Her Majesty’s generosity. During the disastrous floods of 2008 and the severe storms in early 2009, She immediately ordered that packs of food, blankets, clothes and tools to repair homes be distributed to those affected, in order to ensure her subjects were able to recover quickly from these natural disasters. When His Majesty entered the monkhood in 1956, Her Majesty became Regent during that period. She gave the oath of allegiance before the National Assembly. She performed Her duties so well and so satisfactorily that, on the recommendation from the Government, Her Majesty was given the title of higher distinction. She became “Somdech Phraborom Rajininath.” Such a title is given to a Queen who has ably performed the function of the Head of State on behalf of the King, when He was absent from the realm or for some reason was unable to exercise His function temporarily. On the social side, Her Majesty accepted to become the Honorary President of the National Council on Social Welfare of Thailand under His Majesty’s Patronage on August 10, 1961. The organization comprises of around 905 private and public social welfare units throughout the Kingdom and it is now a member of the International Conference of Social Work. The Royal rural development efforts attracted a large number of donors whose contributions formed the basis of SUPPORT, or the Foundation for the Promotion of Supplementary Occupations and Related Techniques, founded in 1976 under Their Majesty’s Royal Patronage and Chairmanship. The promotional work of the foundation has been recognized as highly effective, particularly since SUPPORT provides outlets for local wares and handicrafts from all regions of the Kingdom. In 1979, the Support Foundation Chitralada Training Center was set up to teach Thai arts and crafts to children of landless villagers. Through this project, Her Majesty succeeded in preserving some dying arts. At the present time, there are hundreds of thousands of poor and needy families around the country whose livelihoods have been much improved through Her Majesty’s SUPPORT projects. Her Majesty has always been very devoted to her children. While improving the livelihood of Her people through the SUPPORT Project, Her Majesty worked simultaneously on the conservation of natural resources and the environment. The Highland Agricultural Development Stations initiated by Her Majesty, Her “Forests Love Water”, “Little House in the Big Forest” and “Sirikit Reforestation” project has enabled people to live in harmony with nature. Forests that had been ravaged have been replanted with useful trees and medicinal plants. Watersheds have been restored and preventive measures put in place against forest fires. In addition, during the past decades Her Majesty launched many other notable environmental conservation projects, to name a few: “Offshore Natural Rehabilitation”, “Sea Turtle Conservation”, “Metallic Beetle Conservation”, “Lady Slipper Orchid Conservation By returning Them to the Wilderness”, “Elephant Conservation by Releasing Them to Return to the Forest”, and “Rehabilitation of Thai Fish, River Prawns, Mountain Frogs, Native Fowls, etc., to Feed the People”. On this most auspicious occasion, the management and staff of the Pattaya Mail Media Group join the Thai people and the many others from around the world to present our loyalty and devotion to Her Majesty Queen Sirikit and best wishes for a most Happy Birthday and a continued long life on the occasion of her 86th birthday Friday, August 12.